Volvo is celebrating the upcoming 2014-2015 Volvo Ocean Race via the introduction of a special edition car – the fifth generation Volvo Ocean Race Edition. 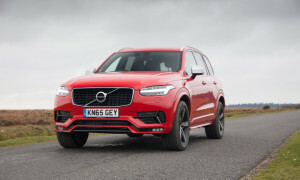 It will include the V40, V40 Cross Country, V60 and XC60 models, and will be officially unveiled at the 2014 Geneva Motor Show. At the show, the company will also introduce the V70 and XC70 Editions. Volvo Ocean Race includes a route which features 11 cities in 11 countries, and as a matter of fact, the teams cover 38,739 nautical miles that are equivalent to 71,745 km. The Volvo Ocean Race Edition models come to reflect brand’s strategy on designing cars around customer’s active lifestyle and exciting adventures. In addition, the vehicles do not compromise on safety, environmental care and fuel-efficiency. The current model line-up will be offered in four colors – Ocean Blue II, Bright Silver, Black Sapphire and Crystal White. What is more, it will sport unique seven-spoke ‘Portunus’ wheel that will come in 17-inch size for the V40 and V40 Cross Country, and 18-inch for the V60 and XC60. The Volvo Ocean Race identification is displayed on the tread plates and front fenders as well as in the start-up sequence on the Infotainment screen. The interior of the cars is as unique and exclusive as the exterior. Precisely, it will offer to the occupants black or blond leather upholstery with orange stitching and the Volvo Ocean Race logo in orange. The same orange stitching can be also found on the door panels and floor mats, which also have a special rubber tag attached. There is also a unique deco inlay, while the load cover on the V60 and XC60 is decorated with a Volvo Ocean Race map and logo. Volvo Ocean Race Edition is planed for production staring this spring.